Keith Law and Rob Neyer, two guys who know more baseball than we've forgotten — wait ... is that how that phrase goes? — but they can't vote for the Hall of Fame. 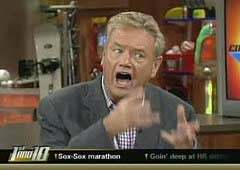 Woody Paige can. Vegas Watch looks at Paige's detailed, thorough thought process. For example, his considerable deliberation on Goose Gossage. "Gossage — During a visit to Yankee Stadium in the late 1970s, I wanted to talk to Goose but was told he was cruel and gruff to reporters. I sheepishly introduced myself and said I was from Colorado, his home state, and he talked pleasantly for 30 minutes. We've been good friends since. I would vote for him even if he wasn't deserving." So that's taking the process seriously! We would like to know who else was kind and pleasant to Woody Paige in the past; might help us handicap Hall of Fame races. We suppose this eliminates Rita Ragone.